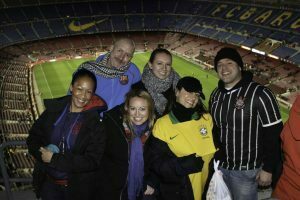 Google “TEFL certification Barcelona” and you’ll see an array of TEFL classes ranging in price from €200 to over €1,500. How can there be such a difference in price if all these courses offer the same thing, you think to yourself? Well, at the end of the day, do they all really offer the same thing? Firstly, let’s think about the job you’re preparing for. You maybe moving halfway across the world to work as a professional English teacher. You are likely to be responsible for teaching around 20-30 hours per week. You’ll need to plan effective lessons so that your students progress in the language. You could be managing a classroom full of 20 students, and teaching things like grammar, vocabulary, as well as developing their comprehension skills. You’ll be in charge of tailoring class activities to your students’ needs, designing tests, and giving your students constructive feedback on their stregths and weaknesses. These are the basic skills you’ll have to master to excel in your new job abroad, and keep your students happy and thier motivation to continue high. Now, what about getting a job? Getting a job in Barcelona can be challenging. Are you confident that €200-€500 TEFL certification will make you a professional English teacher and then also include the personalized guidance, resources, and assistance you’ll need to get a job teaching English in Barcelona or anywhere in the world? Bottom line, you get what you pay for. Whether it’s a mobile phone, a pair of shoes, or a TEFL class, you get what you pay for. Like everything else in the world, if something seems too good to be true, especially when it comes to price, it probably is. Is it a recent graduate? Is it someone who has taught English in China for a year? Or is it a professional, university-level instructor? Just because someone is TEFL-certified and has taught English abroad does NOT mean they are qualified to teach you how to become a professional EFL teacher. Just because you graduated from Law School does not mean you can now teach Law classes at Harvard. They are not the same. A university-level, professional TEFL training class should be taught by a highly qualified instructor with the equivalent of a Master’s degree in TEFL/TESOL, or a related field. You should expect to receive weekly feedback from your professor on your assignments, so you’re constantly learning and developing into a better teacher. Your instructor should also have a wealth of experience teaching English as a foreign language. Key takeaway: You need to pay a university-level instructor like a university-level instructor. This hourly wage is significantly more than someone who taught abroad for a year in China with a TEFL certificate. A common reason why some TEFL courses are so cheap is because they aren’t taught by qualified professional instructors. Tip! When you enquire about a TEFL class at a particular TEFL school or company, ask them straight up who teaches their classes and if they have a link they can send you that details their qualifications. Is the TEFL Course Accredited & Does It Meet International Standards? If you are hoping to be able to secure a decent job at reputable schools as a professional teacher, don’t bother taking a TEFL class unless you’re gaining an internationally recognised and accredited TEFL certification that is accepted by employers around the world. Like university-level instructors, the best accreditation costs money. The process of getting your TEFL class accredited is not exciting or glamorous and, be warned, a lot of industry jargon is about to appear. But stay with it, as this information is particularly important. From there, TEFL schools expect ongoing spot audits of student projects, lesson plans, and more. Time is money, as they say, and this process takes both a lot of time and a lot of money. Then there’s the actual cost of each certification being approved, authenticated, and individually numbered by the accreditor. 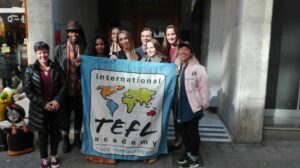 Any reputable TEFL school would be paying about €30-€50 per certificate. To cut corners (and costs) companies will buy an accreditation with a one-time €1,000 fee, for example, and then that school issues certificates without any real oversight (not good). 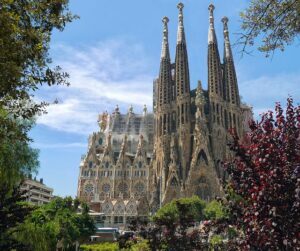 At the very least, when looking at the TEFL providers in Barcelona, make sure your class is accredited and has 100-hours of academic coursework and a minimum of 6 hours of practicum (live practice teaching with real EFL students). This is impossible to do in short courses, so avoid those cheaper courses you see being held in hotels over the weekend. Key takeaway: Check the finer points of the TEFL course – do you get 6 hours of teaching practicum, with real students followed by feedback from an experienced professor who gives you points to work on in your next lessons, and develop as a teacher! What Support & Guidance Are Included to Help Me Find a Job? What does that €200, €500, etc. TEFL class really include? To sum up, at this point you’ve been taught by a university-level instructor, and you’ve also received an internationally accredited and recognised TEFL qualificcation all for a cost equivalent to an average road bike. What should happen after your TEFL class? Are you sent links to a few job boards and told, “good luck!? Or are you working with a trained professional who is helping you create a customized plan for your job search so that you know where to start? You need to know if you’re receiving any sort of post-course job search guidance. You need to know how much (if any) human interaction or personalized support is included in your tuition. Will you have access to networking opportunities or a way to connect with fellow alumni? You want to work with trained, professional TEFL advisors that have been and done what you want to do, lived overseas before, and truly live and breathe international travel. You want an advisor who is trained on the finer details of international teaching markets and can advise you on countries you’re qualified for, requirements for the position, salaries you can expect, and everything in between. You should plan on being able to engage with your TEFL class professor for support during your course. Once you’re ready to begin your job search for your desired teaching position, you’ll need to work with an expert job search advisor to map out your unique job search. Key Takeaway: If you’re paying €500 for merely a TEFL certificate that includes little to no personalized, expert post-course guidance then think twice. You’re seriously going to give up your current job and apartment, pack up all of your belongings, and get on a plane halfway across the world to start a brand new career without any professional guidance or advising? Save yourself countless hours of frustration and Googling, and work with a professional whose full-time career it is to help you make this move abroad. This entry was posted in Beware of cheap TEFL courses and tagged accreditation, job guidance, job placement assistance, tefl certification.